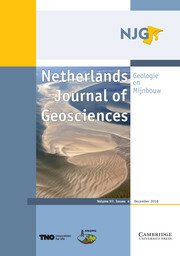 Netherlands Journal of Geosciences - Geologie en Mijnbouw is a fully open access journal which publishes papers on all aspects of geoscience, providing they are of international interest and quality. As the official publication of the 'Netherlands Journal of Geosciences' Foundation the journal publishes new and significant research in geosciences with a regional focus on the Netherlands, the North Sea region and relevant adjacent areas. A wide range of topics within the geosciences are covered in the journal, including "geology, physical geography, geophyics, (geo-)archeology, paleontology, hydro(geo)logy, hydrocarbon exploration, modelling and visualisation." The journal is a continuation of Geologie and Mijnbouw (published by the Royal Geological and Mining Society of the Netherlands, KNGMG) and Mededelingen Nederlands Instituut voor Toegepaste Geowetenschappen (published by TNO Geological Survey of the Netherlands). The journal is published in full colour.